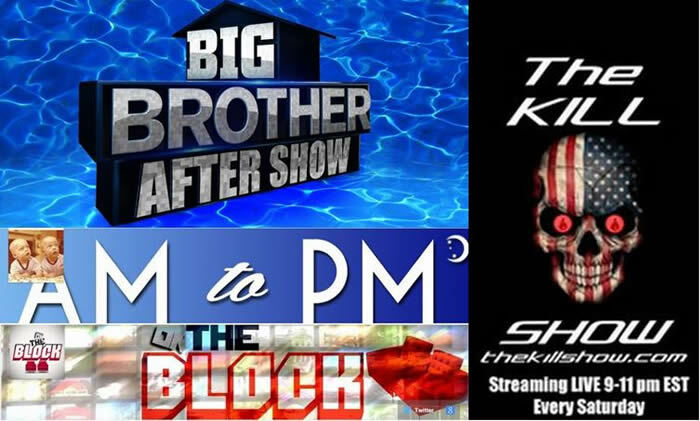 Big Brother 17 - After Show - On The Block - AM 2 PM - Kill Show! Podcast Mashup! Big Brother Spoilers > Big Brother > Big Brother 17 > Big Brother 17 – After Show – On The Block – AM 2 PM – Kill Show! Podcast Mashup! Big Brother 17 – After Show – On The Block – AM 2 PM – Kill Show! Podcast Mashup! The Big Brother After Show – Episode 7 – hosted by Kevin Zelman, Ryan Hooks, Ashley Iocco (BB Season 14), Jen Johnson (BB Season 8) – all super fans! On the Block – with Spencer Clawson and Mccrae Olsen from Big Brother 15 welcome Clay Honeycutt for his press day interview. They analyse the game and talk about how Shelli can move forward in the game without Clay. They reveal to Clay that Johnny Mac is actually a superfan and Vanessa is a multi-millionaire with a mansion in Las Vegas. Big Brother 17 – AM 2 PM Episode 7 – Twins Andrew Monaghan (Big Brother Canada 1) and Pete Monaghan discuss the end of the Battle of the Block, Making deals while enduring an HOH comp, the twistiest twist that is the BB Takeover and Jace getting his face replaced. Plus the Douchebag of the week!! Please subscribe. How to Watch Big Brother AM 2 PM Special Episode – In this special Episode of AM2PM, Pete tells you about some great ways to get into the Big Brother community.